Talking about John 'Wickham Gascoyne Berresford Uncle Tom Cobley' Steed and the stage version of The Avengers, is any of it useful in a canonical sense? I would venture that 100% of us present have never had the luck to see the play, so what can we gleam from the evidence we do have? Did Hana Wilde (and her dichotomous spelling) have a part in Steed's life post The Superlative Seven, post Tara King? Does the Brian Clemens and Terence Feeley 1971 version fit in with Avengers 1961-69 and New Avengers 76-77? Well, there's nothing explicitly countering the canon in it as near as I can tell--we never had an alternative middle names for Steed, and while we knew he must have at least one sibling (to give him those nieces/nephews we know exist), there was never indication of whether they were brothers or sisters, so making him have seven older sisters isn't running counter to anything, either. And there's that big gap to fill between Tara and TNA where he could have easily had another partner who happened to look like Sue Lloyd. I assume Tara would have stuck around into the early seventies, and I think it's safe to assume Steed and Gambit were a double-act for a period of time pre-TNA before they picked up Purdey, but that still leaves a window of three or four years for someone to step in (I've addressed all this in fanfic, but it's anyone's game). I guess the biggest sticking point is the Hannah Wild/Hana Wilde character, whether or not it's too much of a stretch to accept that a) Avengerland could be occupied by different two women with the same name, albeit different spellings, both of whom Steed encounters at some point, or b) it's the same character, and she just so happens to look less like Charlotte Rampling and more like Sue Lloyd this time around. Hey, this is a universe where two Boris Kartovski's were hanging around, so a) is entirely possible! Anything that doesn't directly counter the canon is. Even Steed's newly-acquired female butler, James. In "The White Dwarf" Steed explicity says he doesn't have a brother. CATHY: ... What would you do if someone came bursting in here and accused your brother of perpetrating a swindle? 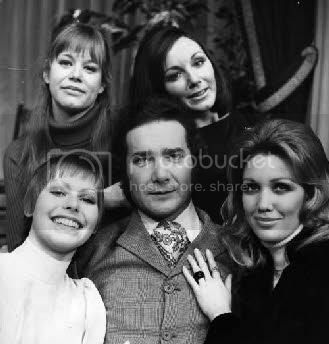 STEED: I only had sisters. CATHY: ... After all, what would you do if someone came bursting in here and accused your brother of perpetrating a swindle? STEED:I should be very surprised, I haven't got a brother. I stand corrected! Thanks, Piers. So now the only question is not whether he has sisters but whether or not there are seven of them! Found this interesting blog which mentions the ill fated stage endeavour in 1971. It has pics that are new to me, so thought that there might be some here that have not seen them either. The lady on the far right of this pic looks very much like Annette Andre I think. She looks hugely like Annette Andre! Is it possible it actually is Annette Andre? Randall and Hopkirk would have been wrapped up at that point. I've never seen the picture before. I've become strangely fascinated with the idea of Simon Oates as Steed. Somehow I think I would have enjoyed him in the part. I know the play was supposed to be a mess, but I wish I could have seen it anyway. I thought I wasn't seeing things. It is her I think. Perhaps she was originally cast in the show and had to drop out, or perhaps she was visiting Simon Oats? Someone should ask her about this Avengers mystery. She was far too famous to have played one of the 'dolly birds' and she wasn't that type of actress anyway. It certainly would have been an interesting to see Annette as Hannah Wilde. I wonder if dear old Leslie Phillips might remember, if we could contact him? I'm 90% sure it's her. My first guess was that she was visiting the show, or Simon Oates (was she ever in anything with Simon? Probably). I agree she was too famous to play a nameless girl in the background--probably more famous than Sue Lloyd at that point (not to denigrate the lovely Sue. I promise to watch The Baron one of these days). Could it be some sort of promo thing? Are the other women notable as well? They could all be there for a photo op, trying to drum up some publicity for the play? Yes, that is Annette Andre. The photo's from a 1973 London West End play. Ah, it's made it look like it was from the same production. Mystery solved. Thanks, Alan. It looks like it was from Francis Durbridge's Suddenly At Home. Ah, good, we're both not seeing things then! Thanks, Alan. Could it be some sort of promo thing? Are the other women notable as well? "Simon Oates returns to the West End Theatre in Francis Durbridge's hit thriller 'Suddenly At Home' with four leading ladies, left to right, Harriet Philpin, Moira Foot, Lesley Goldie, and Annette Andre." I recognised Harriet Philpin instantly, which led me to the Doom Watch site and there's that very nice photo! I thought that was Judy Carne opposite Annette Andre but apparently not. Thanks, Franky. I don't recognise any of the other names. The only person I know who was on Doomwatch is John Paul (the good Dr. Kendrick in TNA). I suppose I ought to watch it one day. As a Durbridge fan, I really should have remembered that the play was one of his! So, thanks to you too, Dandy and Franky! I wonder if the script would be suitable for a future Script Book release? If I could get hold of it, I'd move heaven and earth to get it out there. No luck so far, though! has anyone seen this production ? or know someone who went ? Someone must've. Though not me - if I'd seen Annette André and Harriet Philpin in the flesh, I'd have melted. probably a promo thing for the period. but, at least material like this, is still around for us to ponder over..
[MOD: This conundrum has already been answered earlier in this thread].